Participate in the Eat to Defeat ALS fundraiser! Enjoy a delicious barbeque* dinner prepared by The Spaghetti Hill Gang, entertainment from your concierge server, and vote for The Best Server in the World. Find great items in the silent auction and get lucky with the Big Raffle. 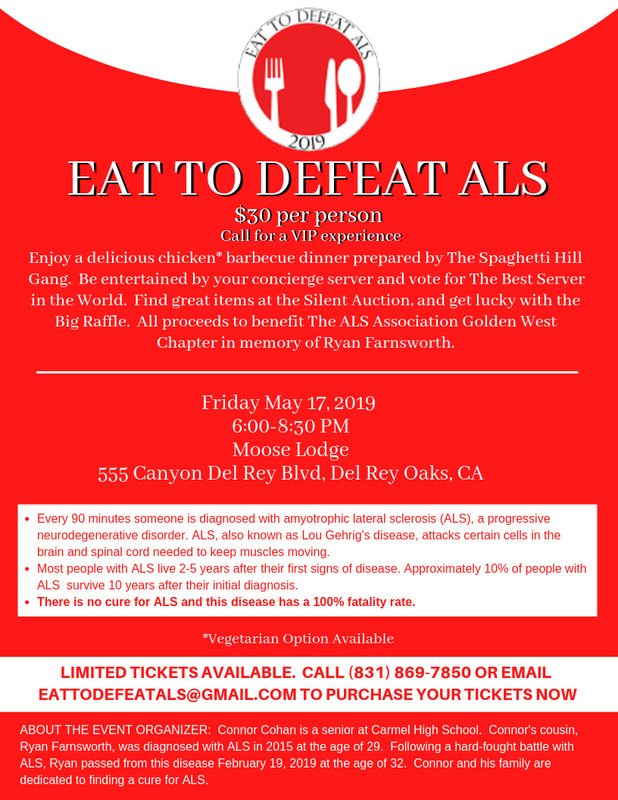 For tickets, call (831) 869 - 7850 or email EATtoDefeatALS@gmail.com. All proceeds will benefit The ALS Association Golden West Chapter, in memory of Ryan Farnsworth. *Chicken and vegetarian meal options available.